My opponent (blue) closed the field... I will never get back my shepherd, right? Sounds right. Though you could have the Dragon eat him and get him back that way. All I have to say is that is a very good move by blue. As Brian suggests, if playing with Expansion 3, you might try to get the dragon to eat it and the sheep in order to get it back. Otherwise, well played blue for sure. Well played Blue, well played! Herd the Sheep into the stable! You can score the sheep at any time. 3 points for the sheep and they go back into the bag then you get your shepherd back! Sadly, you cannot score Shepherds at any time. You must do the Gather the Flock action, which is one of the two options that you can choose after placing a tile. Once again, in this particular scenario, blue blocked red from using their shepherd for the rest of the game (unless playing with the Dragon). As pointed out, not true. You have to be able to expand your field in order to score it. Now that it is complete, there is no way to score it. The only way to get the Shepherd back is if you are also playing with the Dragon. *... or tower, or plague, or Festival, or even the dreaded Catapult! I don't know about the Plague, but the other three won't work as their abilities don't have a special inclusion to affect non-follower figures. Correct. The Shepherd is not a follower so not affected like normal followers. The Dragon is the only exception I am aware of in this situation, as it clearly states the dragon's eating habits for shepherds. Plague, as far as I know, impact followers only so not Shepherds. My mistake. The tower can only be used to capture followers. It is explicitly stated that a shepherd is not a follower. The knockout token in the Catapult also applies to followers only. It appears I was only 25% correct. The Festival definitely applies to all figures. That'll teach me to respond quickly before checking my facts. Regardless, this is a great expansion, and Blue made a great play in the example above. ... and Blue made a great play in the example above. More accurately stated, I think, that is a very poor play by Red. I googled for this exact problem and the first result was this page. While it's true that by the translated English rules the shepherd would be trapped (and I saw this repeated in other English speaking forums). But in the German rulebook (I have one that comes with the Big Box 6) there is an exception that states: whenever a field is closed (completed) the players who have a Shepherd on that field will take the Gather the Flock action, thus scoring the sheep and getting their shepherd back. But yes, even rules in Spanish do not allow any further action. Sonderfall: Grenzt ein Spieler eine Wiese komplett durch Straßen oder Stadmauern ein, wird für diese Wiese sofort die Aktion "Herde in den Stall treiben" ausgelöst. 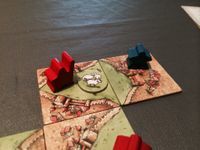 Special case: If a player surrounded a farm completely with roads or city walls, then the action "Herd the flock into the stable" triggers immediately for the shepherds farm. That means when a farm is surrounded and "closed" with roads and cities - and it can't expand anymore. Then the score for the shepherd takes place. The player earns points for the sheep, the sheeps go to the bag and the shepherd goes to the players supply. The English BigBox rule is different than the German rule, because this special case was put in the German rule from the wishes of the correction readers for the German rule - short time before printing.